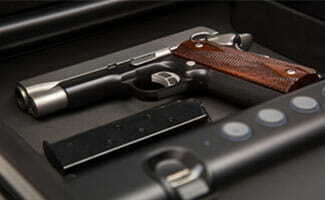 As a responsible gun owner, you know how important it is to keep your firearm stored securely when you aren’t using it. This is particularly crucial if you have children in your home. The ideal handgun safe should give you easy access to your weapon when you need it for recreation or home defense—but more importantly, it should keep your gun out of the wrong hands, whether you’re worried about accidental shootings or theft. We’ve separated our favorite safes into two categories—mechanical locking safes and electrical locking safes. Mechanical locking safes don’t need power and are very straightforward. Electrical locking safes usually need batteries and open very quickly. Mechanical safes are a good option if you prefer a no-nonsense, very simple option. Electrical safes are great for those who are looking for speed, newer technology, and convenient features like internal lighting. While there are many types of mechanical locking safes, we only recommend ones with easy-to-use pattern locks. A safe with a key or a dial lock may work well if you’re storing rifles and other large guns, but since we are focusing on handgun safes, we felt that relatively quick access was a priority. 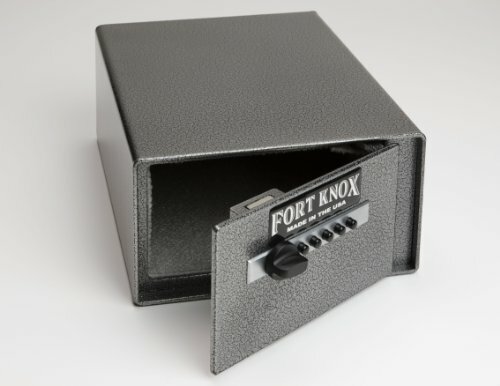 This Fort Knox safe takes the top spot because it is simple, secure, and convenient. It is compact enough to easily install in a drawer or corner of a closet, but it has a bit more space than the other handgun safes we looked at, which means you should be able to fit a larger revolver, two compact semiautomatics, or a semiautomatic and a spare clip or two. 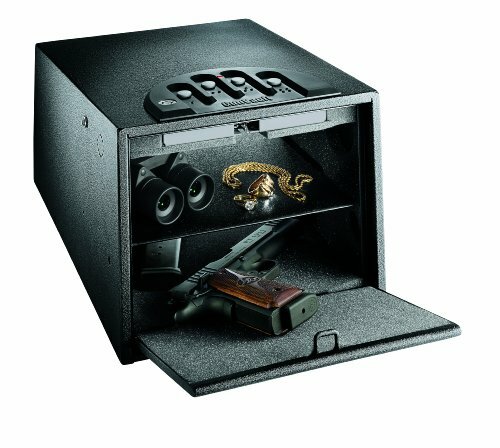 Since many gun owners have multiple guns, we gave priority to a safe with a little extra room. This safe uses a Simplex lock, which is reliable and easy to use. While it might not be quite as fast as some digital locks, it still opens very quickly. We also like the PB1 because of its unibody construction, wrap-around style door, and concealed hinge—all features that make it particularly difficult to break in to. 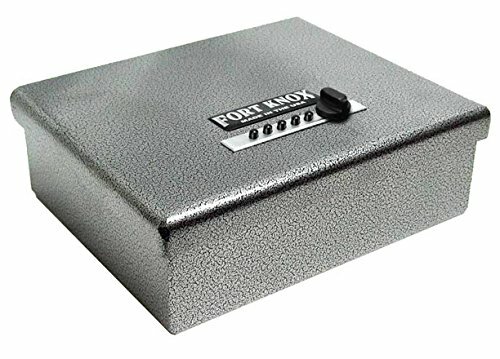 The Fort Knox Personal Pistol Safe is very similar to the PB1 Handgun Safe. It is almost exactly the same price and has many of the same features, including an easy-to-use Simplex lock, a 10-gauge steel body, and a lifetime manufacturer’s warranty. It comes in second because it has slightly less storage space than our top pick and because it is lined with carpet instead of the slightly nicer foam in the PB1. If you need room for more than one compact semiautomatic, this safe should still work, but it could be a tighter fit than the PB1. Our third-place pick is much smaller than the Fort Knox safes mentioned above. Like the other safes recommended, it uses a Simplex mechanical lock. Although it is less sturdy than the Fort Knox safes, it is much more portable. It comes with pre-drilled bolt holes, so you can permanently mount it in your home—but you can also purchase a mounting bracket and mount your safe to that instead. In fact, if you’d like this safe to double as a car safe, you could purchase one mounting bracket for your home and another for your vehicle. Unlike manual locking safes, electrical locking safes need power to work. However, they also include extra features that aren’t available with manual safes. For example, digital locking safes usually open very quickly and have more keypad combination options. Some also have nice features like internal lighting. Because being dependent on power is a drawback, we only recommend electrical locking safes that also come with a backup option like a manual lock and key. That means you’ll still have access to your firearms if your battery dies. We like GunVault’s Multi Vault Deluxe safe for many of the same reasons we like Fort Knox’s PB1—it is sturdy, has room for multiple guns, and has an easy-to-use keypad. Unlike the Fort Knox safe, the GunVault has an electrical lock with over 12 million selectable access codes. 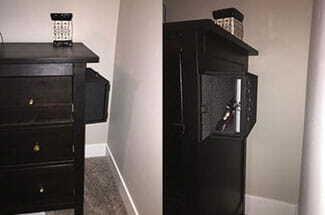 The GunVault also has a no-eyes keypad to make it easier to open, a shelf for easy storage, and a computer that will block access after repeated invalid attempts to open the safe. This safe beat out the other electrical safes on our list because it is incredibly strong, loaded with convenient features, and more affordably priced than the runner up. 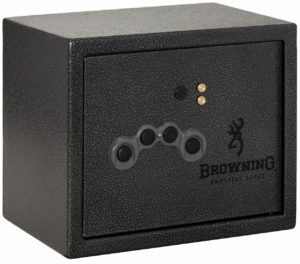 This Browning handgun safe is new for 2017, but we chose it over Browning’s older safe, the PV1500, because it costs less, has most of the same features, and still has room for multiple handguns. It lost the top spot because it is more expensive than the GunVault and has fewer consumer reviews, but it still comes with many convenient features like interior lighting and a spring assisted lid. One of our favorite things about this Browning safe is its extra backup entry option. The primary mode of entry is the four-button keypad that lets you program a personal code—it runs on AA batteries, which are usually relatively inexpensive and easy to find. If your batteries have run out, you can use the manual key lock to open your safe, but Browning’s vault stands apart from the rest by including a third option–external electrical contacts that can power the keypad if your AA batteries have run out and your key isn’t available. This means that you can hook up a 9-volt battery to the contacts on the outside of your safe to open it and access your firearms if you don’t have time to replace the normal batteries or go looking for your key. This Sentry safe is a lot like our third-place mechanical safe recommendation—it is less sturdy than the other options and has less space inside, but it is more affordable and easier to store. One interesting feature of this safe is the backlit electrical lock with no audible feedback. 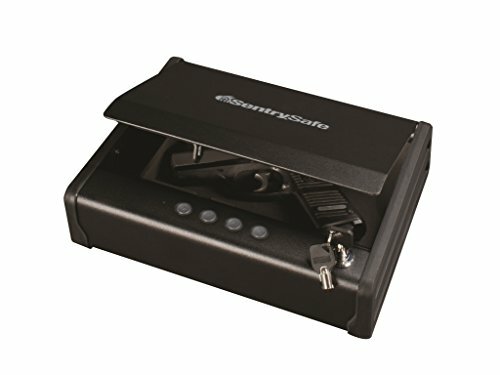 This makes it easy to open your safe without being heard. One of the best things about this safe is the compression gas strut that helps to open the door and keep it open so that you can access your safe one-handed. 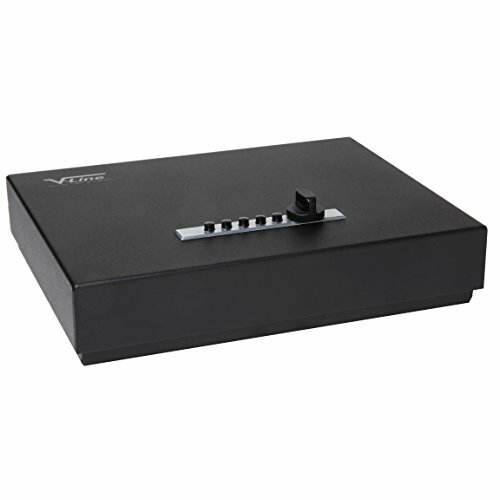 The safe also comes with a master override key as a backup option for opening your safe. The mechanical safes on our list are simple and sturdy, and if you choose one you’ll never have to worry about batteries running out when you need access to your firearms. While other mechanical safes on the market open with keys, the ones we chose all have pattern-style Simplex locks, so you don’t have to worry about losing a key. 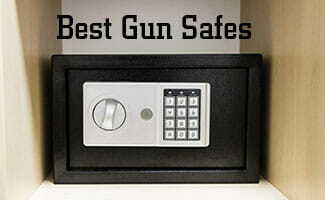 The electrical safes on our list all give you quick access to your firearms and backup methods of access to your safe. They come with backup keys so you can still unlock your safe if the batteries run out or if you forget your combination. We think choosing between these styles is a matter of personal preference. If you love the idea of a no-fuss safe that keeps your guns secure, a mechanical safe may be right for you. If you’re looking for speed, convenience, and new technology, you may be more interested in an electrical safe. Why aren’t there any biometric safes on this list? While biometric technology is exciting, we don’t feel that it is quite advanced enough for something as serious as storing a firearm. If you’ve ever had trouble getting your smartphone to read your fingerprint, you can imagine the frustration you’d feel trying to access your firearm in a high-pressure situation if the reader had trouble. In many cases, the biometric safes work well when you’re calm and relaxed, but if your fingers are sweaty, you may not be able to open your safe. The other reason we left biometric safes off the list is cost. Many of the safes we’ve recommended are also offered with biometric locks, but this significantly increases the price of the safe. Since the keypad lock versions of these safes open quickly and keep your firearms secure, we felt the increased expense was unnecessary. If you are still excited about the advanced technology and personalization that you get with a biometric handgun safe, there are some cool options out there—refer to our earlier best gun safes post for our reviews of specific biometric safes. The main purpose of a gun safe is to keep your firearms out of the hands of those who shouldn’t have access to them, whether that is a child or a burglar. All of the safes we’ve recommended are well suited to that purpose, but choosing a specific safe will come down to your personal priorities. Are there children in your home? Are you planning on using your handgun for home defense? Do you own multiple handguns? What other measures will you take to keep your guns and loved ones safe? A safe is important—but it is only one small part of responsible gun ownership. Read through our previous post for more information about gun safety in the home. Once you’ve determined your priorities, we encourage you to select an option that will keep your guns secure and your family safe. We confidently recommend the handgun safes listed in this post, but if you want to keep exploring your options, continue your search below.